Alcohol has become such an accepted part of contemporary life yet many people think that because of the devastating consequences it can have on a person's life, that it should be considered a drug. Government guidelines recommend that a woman not exceed 14 units of alcohol a week, and that men not exceed 21 units a week. The number of units per week you are consuming can be difficult to determine. One unit is said to be equivalent to a small glass of wine, or a half pint of beer. However, this guideline also depends on the strength of the alcohol, which can vary widely from brand to brand. If you are at all unsure as to how many units of alcohol you are consuming a week, there are several websites you can consult. Life has become more fast and furious. More and more people find themselves under tremendous pressure at work and alcohol is a quick and easily accessible way of forgetting your troubles. Alcohol is also part of the culture of striking deals and entertaining clients. Binge drinking as an accepted part of socialising amongst young people is giving cause for concern. In other cases, there may have been some kind of trauma or bereavement and alcohol has become a way of numbing out feelings. This is also sometimes the case with those experiencing depression where alcohol can seem to make things bearable. Excess alcohol can impact your life in many ways. Clearly, there are health issues to consider. Alcohol is a toxic substance to the body, and when consumed in excessive amounts on a frequent basis can affect the functioning of many organs of the body. In extreme cases, it can put a person at risk of stroke or heart attack. It can also affect relationships with family and friends. Someone under the influence of alcohol is not truly available as themselves to another person. Friends can begin to shun a person whose alcohol consumption is high simply because they are not getting much out of the relationship. Within the family, it can be even more devastating. Whether you decide you want to stop drinking altogether, or you want to get your drinking down, hypnotherapy can be very useful. So that treatment can be tailored specifically to your needs, your hypnotherapist will want details about the circumstances in which you drink, how much you drink and what you drink. The may ask you to keep a diary for a week before seeing you so that you can see how much you are drinking. Your hypnotherapist will also ask you about the effects of drinking on your life and how your life will be improved by changing your drinking habits. Please be assured, your therapist will not be making any judgments so the more frank and open you are, the better equipped they will be to help you. As with all hypnotherapy treatment, the techniques used will depend on your particular needs. However, therapists recognise that for the most part, people have within them the resources they need to make the changes they want. Your therapist will want to highlight these as part of treatment. You might also be taken through a process of imagining yourself in future situations coping perfectly adequately without alcohol. 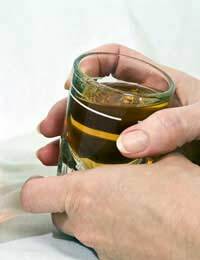 In some circumstances, the therapist might use an aversion technique so that the smell of alcohol is linked to something unpleasant such as a feeling of nausea. In other cases, your therapist will help you find alternative strategies for dealing with the need alcohol is currently fulfilling. All treatment is aimed at helping you realise that you are perfectly capable of leading a life where alcohol consumption is within your control, not controlling you. If you think your alcohol consumption is more than it should be for you getting the most out of your life, hypnotherapy could well be for you.